Believe it or not, I don’t eat dessert for every meal. You wouldn’t know it just looking at the recipes on this site, but it’s true. This crustless quiche makes for a quick and easy weeknight dinner. You can substitute just about any fresh vegetables you have on hand to suit your taste. If you have family members who aren’t big fans of veggies, it’s a good way to sneak some veggies into them. Even the leftovers are great for a quick breakfast or lunch on workdays! And did I mention you can serve it with bacon? Use whatever cheese you have on hand – this time I used 1 cup of swiss and 1 cup of cheddar. Make sure you squeeze the thawed spinach well to remove the excess water. I usually serve with fresh fruit and bacon. Preheat oven to 350°F. Spray 9-inch round pie pan or quiche dish with cooking spray. In a medium skillet, heat olive oil over medium heat. Saute onion until translucent. Stir in thawed spinach and bell pepper. Cook for 2-3 more minutes, just until everything is warm. Remove from heat. In a medium bowl, whisk together eggs, milk and salt. Stir in 1 3/4 cups of cheese. Spoon spinach mixture evenly into bottom of prepared pie pan. Pour egg mixture over top of spinach mixture. Stir gently just to make sure egg is incorporated. Sprinkle remaining 1/4 cup of cheese on top. Bake at 350°F for 25-30 minutes, or until the center is set. Cool 10 minutes, then serve warm. 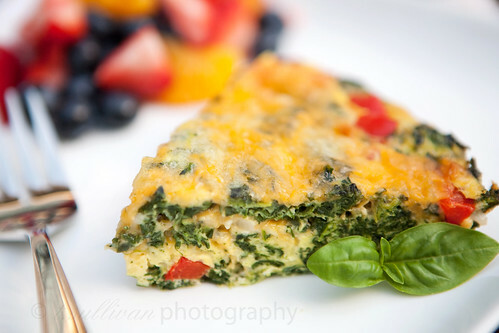 LOVE spinach quiche and this one looks lovely. And better for you without the crust.